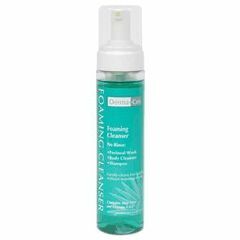 No-Rinse Foaming Skin Cleanser is specially formulated for use on hair, body, and perineal area. This no-rinse solution cleans, conditions and moisturizes the skin. The concentrated foaming dispenser eliminates watseful dripping and reduces the amount of product used per wash, saves time and money. This cleanser contains aloe vere, which is used to promote skin moisture retention. Easy to use. Pleasant smell. less taxing than shower. Used for my 87 yr mom. Was very easy to use,no sticky feeling but really never lathered at all,especially when used in the hair. Thought I'd order online to save trips too the store. I was a little disappointed that this product seemed to dissipate more quickly, than what I used previously. by Mr. P from S.C. I LIKE IT. IT'S VERY GOO. BODY & HAIR & SCALP. I LIVE ALONE, UNFOURTIONATLY. SO,I SPONGE BATH EVERY DAY BECAUSE I'M AFRAID I MIGHT FALL IN THE SHOWER! Convenient. Convenient. Convenient. No spill. Less waste. Better price. Fast Cleanup. When cannot shower. Because I am handicapped, I am unable to shower every night. The no-rinse cleanser helps me clean up before going to bed. Easy to use. great for travel. works. Handicapped. Older (62). less taxing than shower. do yall sell this product by the case, and if so is there a discount?